After generator chamber the gas is again with high temperature from 300 to 400 C0 which requires cooling to ambient temperature in order to achieve high performance of the powerplant. Cooling can be done in different types of heat exchangers with indirect or direct cooling. 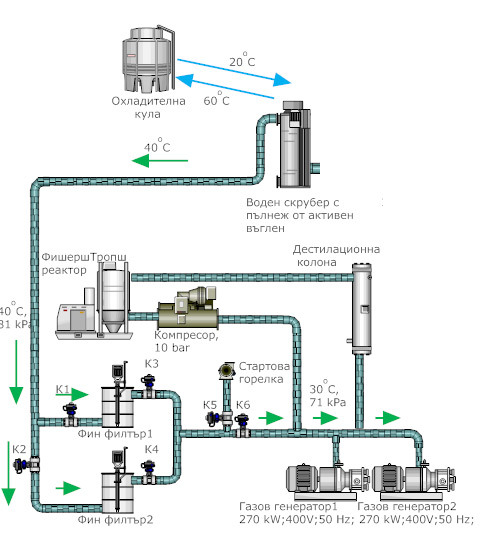 Good for the facility in this case is water scrubber, which besides cooling also purificateas the generator gaz. In the scrubber the gas moves against stream fine water droplets generated by a system of nozzles and then it passes through the charcoal and/or biomass. In this way the gas is cooled and cleaned of residual ash and tar. The temperature of the gas after the scrubber system is about 30 C0. The cooled and cleaned gas can be fed into the engine generator.